The Gallery’s Indo-Pacific art collection represents the art of maritime Southeast Asia and includes about 1,900 objects, with strengths in ethnographic sculpture, Javanese gold from the prehistoric to the late medieval period, and Indonesian textiles. Established in 2009, the Department of Indo-Pacific Art oversees the newest collection at the Yale University Art Gallery. It has four areas of strength: ethnographic sculpture, ancient Javanese gold, textiles, and western Indonesian puppets. The core group of Indonesian textiles was collected by Robert J. Holmgren and Anita E. Spertus. The textiles and the spectacular ethnographic carvings—including ancestral sculpture, ceremonial objects, and architectural components from Indonesia, the Philippines, the aborigines of Taiwan, and mainland Southeast Asia—are a promised gift to the Gallery from Thomas Jaffe, B.A. 1971, who also endowed the department’s curator. The earliest materials in the department’s holdings are a collection of approximately 500 gold objects—coins, jewelry, statues, and ritual objects—from Central and East Java. Donated to the Gallery by Valerie and Hunter Thompson, these date mainly from the 8th to the 13th century but also include some prehistoric material. The collection of puppets, the largest of its kind in the world, consists of more than 125 complete sets (a total of 20,000 puppets) from Java, Bali, Madura, and Lombok. The collection was amassed by Dr. Walter Angst and donated in 2017 by his brother, Sir Henry Angest. The department holds more than 1,000 textiles from Southeast Asia, mainly collected by Robert Holmgren and Anita Spertus. This group is of exceptional quality and ranks among the finest in any museum. The collection includes particularly superb textiles from South Sumatra, Sulawesi, and Borneo, as well as rare and unique weavings that reflect the history of Indonesian designs. The permanent-collection galleries, named for Yale professors Robert Farris Thompson and the late George Kubler, display approximately 450 objects. Regional highlights include sculpture and textiles from Sumatra, Borneo, and Eastern Indonesia. A selection of Javanese gold is also on permanent display. One of the highlights of the Gallery’s holdings in Indo-Pacific art is a collection of about 500 gold objects from Java, an island in southwestern Indonesia, given to the Gallery in 2007 by Valerie and Hunter Thompson. A display of nearly 200 of these works is currently on view in a place of prominence in the museum’s third-floor galleries. One of the largest and finest collections of its kind in any public museum, it encompasses artifacts from prehistoric times—before the arrival in Java of Hinduism and Buddhism—to the 13th century. Gold, rarely found on Java, was imported from Sumatra or possibly Borneo. Javanese goldsmiths then transformed it into jewelry, as well as courtly and temple paraphernalia. 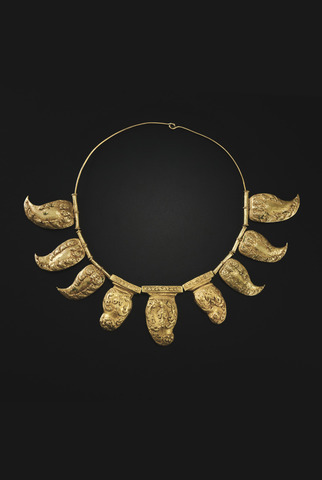 Although gold was associated with spiritual power and the divine, it was also widely used for personal adornment. The objects on display include religious items, jewelry, dancers’ ornaments, and richly decorated handles for kris, Javanese daggers believed to hold great spiritual power. Also showcased is a finely worked crown, which may have been used as a headdress to decorate a stone sculpture or was possibly worn by a central Javanese ruler. This performance of Barikan, a ritual drama of Indonesia, uses shadow puppets (wayang kulit) from the Dr. Walter Angst and Sir Henry Angest Collection of Indonesian Puppets, a recent major gift to the Gallery. Ruth Barnes is the inaugural Thomas Jaffe Curator of Indo-Pacific Art. She received her doctorate from Oxford University and was previously textile curator at the Ashmolean Museum, where she organized exhibitions on Asian and Islamic textiles, early Indian Ocean trade, and the theme of pilgrimage. She was also curator of three new permanent-collection galleries for the Ashmolean’s reopening in 2009. Her publications include The Ikat Textiles of Lamalera and Indian Block-Printed Textiles in Egypt: The Newberry Collection in the Ashmolean Museum, Oxford. Her most recent book, Five Centuries of Indonesian Textiles, co-edited with Mary Kahlenberg, received the R. L. Shep Award in 2010. Barbier, Jean Paul, and Douglas Newton. Islands and Ancestors: Indigenous Styles of Southeast Asia, exh. cat. New York: Metropolitan Museum of Art, 1988. Barnes, Ruth, and Mary Kahlenberg, eds. Five Centuries of Indonesian Textiles. New York: Prestel, 2010. Holmgren, Robert J., and Anita E. Spertus. Early Indonesian Textiles from Three Island Cultures, exh. cat. New York: Metropolitan Museum of Art, 1989. Miksic, John. Old Javanese Gold: The Hunter Thompson Collection at the Yale University Art Gallery, exh. cat. New Haven: Yale University Art Gallery, 2011.